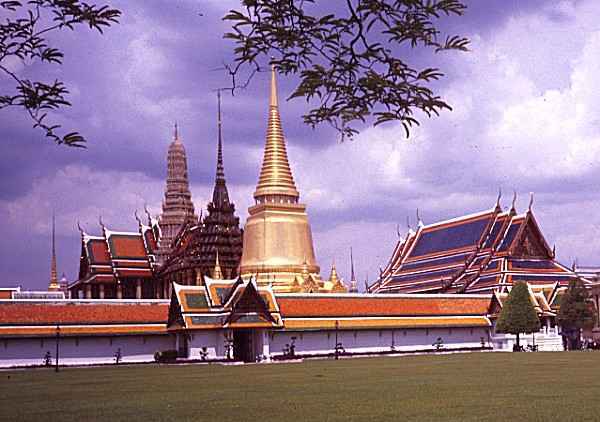 The palaces and temples of Bangkok were excellent and will always be a cherished part of our memories of Thailand. It is worth having a guide - there is a lot to see and you do not want to miss anything. There are hundreds of statues - mostly gilded. The statues and their poses make a refreshing change from yet another saint or Lord of the Manor! In many cases they are internationally well-known and give a sense of deja vu. The many cloisters are also full of statues. ... and sometimes sinister in appearance. In the vast grounds are things to see. 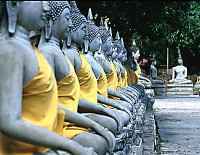 The White Temple or Marble Temple is not typical. 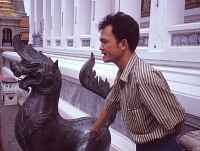 It is styled on European architecture, although the roof is much more in the Thai tradition. This one is solid gold. He weighs several tons and lives in a rather tatty temple in a modest district of town. 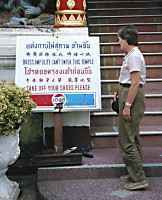 There are some restrictions on entering temples. For example, shorts are not acceptable. There are many outdoor statues and their clothing is changed with the seasons. Of course you meet monks there. We were curious when this drum was beaten. Monks came trotting from all directions. Was it a call to some duties? Soon afterwards we saw them all eating! 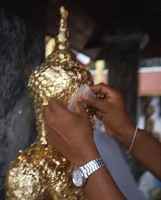 To gain grace, one should buy gold foil and leave it attached to certain statues. 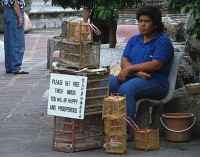 Apparently releasing captive birds gains merit - and must be good for future business! On the other hand, if you do not behave then you may be in for a bleak future! Like being swathed in snakes perhaps? This is a set of photos. - No diary was kept during 1990.